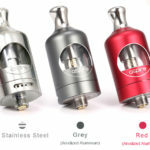 Filling this tank is super easy and convenient, the filling hole is inside the tank, which can be reached by using a gorilla bottle or just as simply by a glass dropper. 1. Locate your filling bottle/dropper onto the spring loaded filling tube and press it down (only minimal pressure is required). 2. Squeeze the filling bottle/dropper to fill the tank. 1. After filling, release pressure on the filling tube to allow it to seal, then release pressure on bottle before removing completely, this will draw off any excess e-liquid and avoid spillage directly onto the coil. 2. Due to the special design of the tank, after the first filling and when replacing the coil, you should turn the tank upside down for 2 minute to help saturate the coil with e-liquid. 1. Unscrew and remove the top chamber. 2. Unscrew and remove the mounting screw. 4. Place a new coil over the filling tube; make sure the coil edge is lined up with the tank, and sits securely. 5. Screw the mounting screw back onto the base hardware. NB: The mounting screw also acts as a ‘spit-back’ guard. 1. Unscrew and remove the glass securing ring from the base hardware. 2. Pull and remove the used glass tube. 3. Insert a new glass tube. 4. Screw the glass securing ring back onto the base hardware firmly, but do not over-tighten. • Do not press the fire button without the top cap in place to avoid potential spitting and hot e-liquid hitting your skin. •Do not press the fire button when not vaping, this may cause excess unvaporized e-liquid to build up inside top chamber which could be unpleasant. • While vaping, periodically invert the tank to ensure that the coil doesn’t dry out, running the risk of burning the coil. 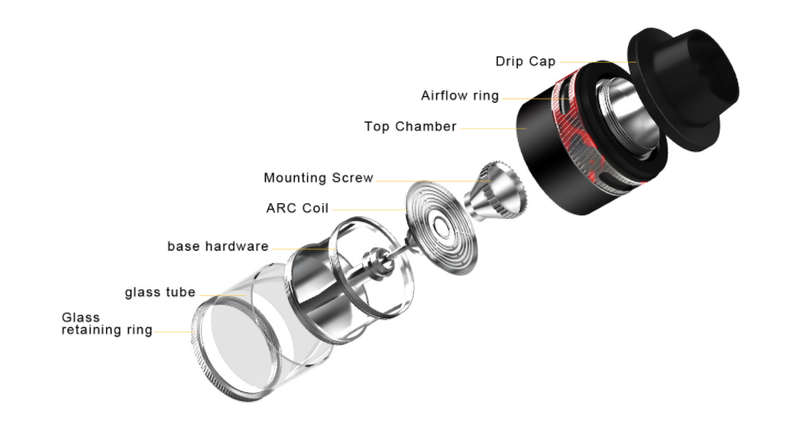 When the mod detects a short or the atomizer attached is below 0.08Ω, the screen will display “Low Res” for 5 seconds. When the control board temperature rises above 75 oC/167 oF, the screen will display “Too Hot” for 5 seconds. 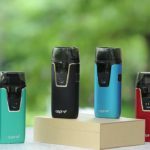 • Over charge Protection: When the internal battery level reaches 4.2V or is fully charged, the mod will stop charging and the screen will remain off. drops below 2.8V, the screen will display ”Low Battery” for 5 seconds to remind you to charge your mod. 1. Press the fire button 5 times within 2 seconds to either lock or unlock the device. While the mod is locked, press the fire button for 3 seconds to turn the system off. To turn the mod back on press the fire button 5 times rapidly. 2. Pressing fire button and down button simultaneously to either lock or unlock keys, which is indicated by a lock symbol on the screen. While the keys are in locked mode, wattage or temperature settings cannot be adjusted but fire button still functions. 3. Pressing fire button and up button simultaneously for 0.5 second will allow you to select between Wattage, Voltage, Bypass, CPS(C1/C2/C3), TC(Ni/Ti/SS316L) and TCR(M1/M2/M3). Pressing up or down button to select modes, fire button to confirm. 4. TCR settings: While the mod is in TCR(M1,M2,M3) or in TC TC(Ni/Ti/SS316L)mode, pressing up and down buttons simultaneously to enter or exit PWR and TCR settings. Pressing fire button to select between PWR and TCR, up and down button to change numbers, PWR numbers can be adjusted from 1W to 100W, while TCR range is from 0.10 to 9.99. 5. When the mod is in CPS(C1/C2/C3) mode, pressing up and down buttons simultaneously will allow you to fine-tune your heat ramp-up (power curve). Pressing up or down button to change wattage, fire button to select time from 1 to 10 seconds, pressing up and down buttons simultaneously again will exit your CPS (Customizable Power Settings). 6. While the mod is in TC mode attaching a new atomizer the mod will read “New Atomizer? ” followed by “YES+/NO-“ Select “YES+” and the mod will read the original coil resistance. Select “NO-“ and the mod will keep its previous coil resistance settings. 7. When the mod is on, pressing the fire button 3 times quickly to put the mod into or out of stealth mode, while in stealth mode the mod can still fire but the wattage or temperature settings cannot be adjusted. 8. To change temperature to Fahrenheit(℉) or to Celsius(℃), press the “+”or “-” button all the way to pass the temperature range, the temperature will switch over to either Celsius or Fahrenheit automatically. 9. The Screen will auto rotate for ease of use. Charging the Typhon 100 via Micro-USB charging port, the maximum current can reach up to 2A. 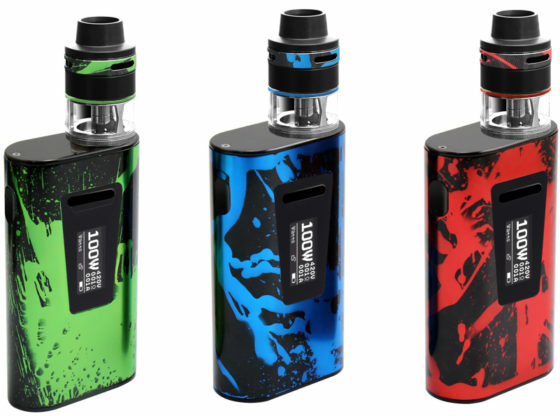 • Connect your Typhon 100 mod to the charger and the screen will display a flashing battery icon as well as battery voltage level, charge current and charge time. When the battery charge reaches 4.2V or is fully charged, the mod will stop charging and the screen will remain off. • When the mod detects the USB charge voltage is less than 4.5V, it will stop charging and the screen will display “CHECK CHARGER”. • To accomplish 2A charge current, the adaptor output should be 5V/2A. • Connect the Typhon 100 to your PC. The driver will detect your mod automatically.